General Motors powertrain boffins are very enthusiastic about the new 1.6-liter Ecotec turbodiesel that is available in the 2017 Chevrolet Cruze. And why not? It has an aluminum block that weighs 44 pounds less than the iron block in the 2.0-liter diesel it replaces, is 68-percent quieter than that engine, peaks at 240 pound-feet of torque with 219 pound-feet available from 1500 rpm to 3250 rpm, and gets 52 mpg on the highway when equipped with a six-speed manual transmission. The 1.6-liter Ecotec available now on 2017 Chevy Cruze LT sedan and hatchback with the choice of the aforementioned six-speed manual or a new nine-speed automatic will soon be added to the all-new Chevrolet Equinox, albeit with only the automatic gearbox. Sound like Chevy is going after Volkswagen’s customers, who won’t ever be able to buy a brand-new diesel VW in the U.S. again? Yes, precisely. But while that’s good news for enthusiasts, it doesn’t mean much for GM’s bottom line. In 2016, Chevrolet sold a total of 432,071 Cruze compacts and Equinox SUVs, topping the entire VW brand in the U.S. by 109,123 units last year. That’s after Cruze sales shrunk along with most of its segment and Equinox sales dipped after Chevy unveiled the new-for-’18 model. Mazda will join Chevrolet in the diesel passenger vehicle fray when it adds a turbodiesel option to its CX-5 compact sport/utility. With VW out of the game, Chevy, GMC, and Mazda will be the only mainstream, non-premium brands to offer diesels in passenger cars and SUVs. The 1.6 diesel offers “choice, with better fuel economy and performance for Chevrolet customers, and it’s one of the lowest-cost options for reduction of CO2 emissions Nicholson said at a briefing on the new engine for its Cruze application,” said Dan Nicholson, GM’s vice president for global propulsion systems, at a briefing on the engine’s application in the Cruze. About 9 percent of the 146,174 Chevy Colorados/GMC Canyons sold last year were equipped with the 2.8-liter Duramax diesel, Nicholson said, adding that he would be happy if diesel volume reached 5 percent of Cruze volume — about 10,000 units based on last year’s sales. It is B20 biodiesel capable, and uses emissions- and particulate-control technology, which means a urea-based after-treatment system. The urea tank, with its filler tube located next to the fuel cap opening, must be refilled about once every 4,000 miles, said Mike Siegrist, assistant chief engineer for the 1.6-liter Ecotec. Engineers added ceramic glow plugs for the North American market, where the climate is generally colder than in Western Europe, Siegrist noted (the change has since been added to all 1.6 Ecotecs). The glow plugs are rated for starting in temperatures as low as -13 degrees Fahrenheit; a dealer-installed accessory plug-in heater extends that to -40F. 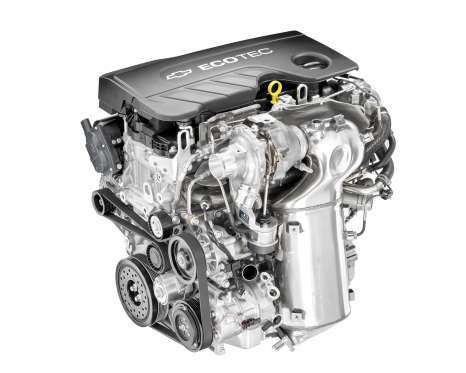 GM builds the 1.6-liter Ecotec in its St. Goddard, Hungary engine plant, which is owned by Adam Opel, which charges a “transfer cost” to any other GM divisions. Although Nicholson told WardsAuto that GM will maintain diesel technology knowhow if Opel/Vauxhall is sold, GM would have to either buy the engines from Peugeot-Citroen, negotiate to keep the Hungarian plant (unlikely if GM essentially pulls out of the European market), or move 1.6-liter production to another engine plant. GM builds 2.8-liter Duramax engines in Thailand and 6.6-liter Duramax engines in Ohio, both with partner Isuzu. Any of those three options could be costly to buy an engine that already adds more than 10 percent to the sticker price of a Chevy Cruze.